"Ordinary people look at things with the old eye, the creative man observes the old things with new eyes." At ITALY Magazine we are passionately dedicated to preserving these traditions and celebrating these humble artisans, who are often too busy working (naturally) than promoting themselves and their work. You’ll find that our e-commerce shop has many new products from local artisans who now have a platform for their made-in-italy crafts. Today we start with a man named Giancarlo Moi, born in 1957 in Carbonia, a place you've likely never heard about, in the center of the island of Sardinia, and the oldest center for mining. Giancarlo was left motherless at the age of three, he was the tenth of fifteen children. At the age of 11, with the consent of his father, he left Sardinia with his older sisters to go to Veneto to join some of the older members of his family who were working in the area. He finished his studies in Vicenza and started to apprentance in the goldsmith profession around age 14, when it was common to do so. Afterwords he started work in a goldsmith factory by day, while at night he took classes at a night school in Vicenza specializing in arts & crafts. Giancarlo did this for over five years, which helped shaped his passion and perseverance for artisan jewelry work. This paid off in 1975 when he was awarded the second prize in the 5th edition of the Sant’Eligio patrono degli orafi (Saint’Eligio is the patron saint of goldsmiths), a contest sponsored by the Ente Fiera and the Presidency of the Italian republic. An important win. Later came a stint in the military (which was previously compulsory for every male in Italy), followed by an important promotion and continued education in the specific artisan jeweler techniques. He married the love of his life, Carla Balbo in 1978, who also had a creative side working in the world of fashion which helped inspire Giancarlo and his work. They honeymooned in Giancarlo’s precious island of Sardinia which later served as the inspiration to them both to open a goldsmith factory in the land of his roots. Before leaving to start this exciting project, the practical side of Giancarlo and Carla kicked in, which made them undertake a sensible study of marketing experience with an American multinational followed by a course of “mental dynamics” in Isreal. Finally in 1980 at the ripe age of 23 years old, they moved to Sardinia when Giancarlo got his food in the door doing market surveys and setting up shop while Carla gave birth to a little girl, named Lisa, the firstborn with a beautiful wide smile. The family settled in Barisardo, a small town along the coast. 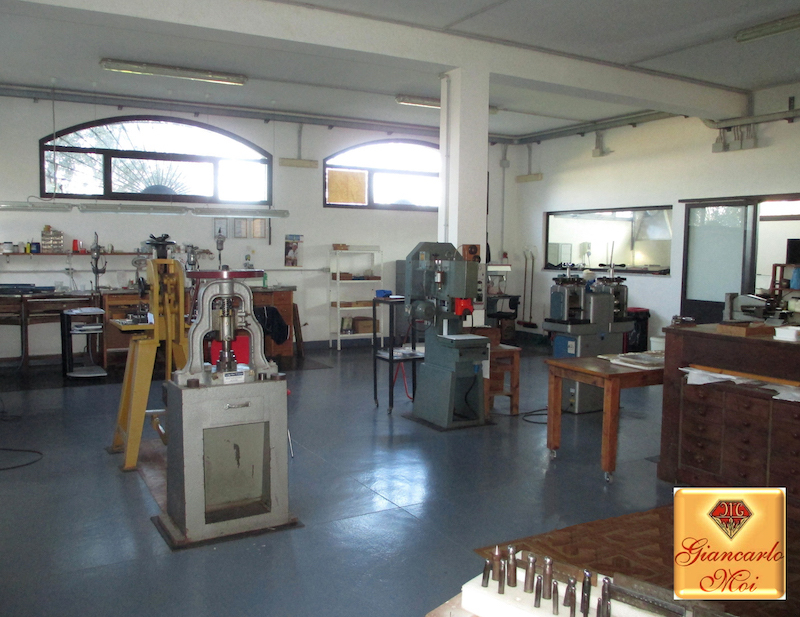 Together with his brother Mario, they started their goldsmith business in the traditional Sardinian style. Later (and with the arrival of two other kids) the brother branched out on their own separate ventures, with Giancarlo teaming together with his wife. At this time, they start to heavily research local traditions, essentially superstitious and talismanic jewels that you often see in local costume jewelry. During this time, he traveled all over Italy to promote his jewelry in the Sardinian tradition and collaborated with a regional project, Sardegna Ricerche, aimed at experimentation in a modern renewal of the Sardinian filigree. The filigree is comprised of ornamental work of fine (typically gold or silver) wire formed into delicate tracery, meant to look by lace. It's a craft that has been appreciated since 2500 B.C, and can be found in several ancient civilizations from the Persians to Egyptians, extending throughout the Greek, Early Renaissance, Romanticism and Art Nouveau eras. The regional project's study led to the creation of a base matrix with which to develop a light, flexible mesh, adaptable to endless and sophisticated compositions. Giancarlo aims to offer a new face and modern look to this ancient treasured tradition. Now you can find Giancarlo on via pigliaru No. 6, in the quiet town of Barisaldo, a beautiful place in Sardinia, known for its traces of ancient settlers, including the nuraghe Sellersu and the chamber tombs or domus de janas. In his workshop, he contuines to work daily creating fascinating items with respect for tradition and in tune with the more modern requirements of style. It's a loving and fun atmosphere as the entire family works together. Imagine tradition blended with modernity. His two daughters Lisa and Giulia are looking to follow in their father’s footsteps by attending arts and crafts/ goldsmith school both in Vicenza and Rome. Their life motto being "Fashion makes you dream, tradition helps you remember." We asked Giancarlo a few questions about his work, read our interview below. Giancarlo, Why did you choose to do this work? After taking aptitide tests at age 14, I was told I should look into the goldsmith craft and engraving. This is something I then felt a great passion for. Is there any particular workmanship or material that makes its products recognizable to everyone? Can you tell me how you design a job, where do you start? The jewel that is born is always inspired by the intrinsic meanings in traditional Sardinian artifacts from the customs and traditions as a result of historical research which we than hand make with metal. How long does each one of your creations take? Usually a few days, but in some of my collections it took over 10 years to develop the production and modeling systems. I have to ask, during this period in the Italian economy, what are some of the difficulties you face in your work? There aren't any real difficulties if I am honest. Marketing is probably the only one, because it takes more time and professionalism, also I have mention the excessive bureaucracy, adding to exaggerated taxation which as you can imagine discourages investment. How do your clients react to your painstaking work? Do you feel thet appreciate the craft? They are usually surprised by the diversity of our products and often give us compliments. They appreciate all the time it takes to complete and are fascinated by the history and meanings contained in the jewels. You can see which items of Giancarlo's we sell in our shop here, and don't forget to shop the rest of our made-in-italy items.